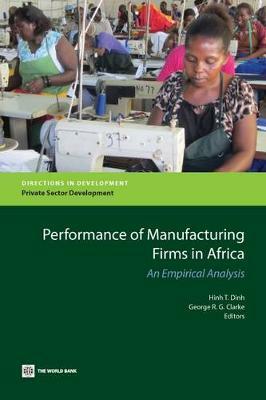 This book presents empirical evidence on manufacturing firm performance in Africa based on the World Bank Enterprise Survey and on a one-time quantitative survey conducted for the World Bank by Oxford University's Centre for the Study of African Economies. Because of their institutional environment, their labor productivity is low, and their labor costs also tend to be low. Key constraints to firm growth vary by country, by sector, and by firm size. But the binding constraints for most large formal firms in Africa are access to finance and to electricity. The binding constraints for small firms tend to be access to finance and competition from foreign firms. After controlling for differences in firm characteristics, geography, infrastructure, political and institutional factors, business environment, and finance, the authors show that African manufacturing actually has a conditional advantage in productivity and sales growth. Political and institutional factors (especially party monopoly), access to finance, and the nature of the business environment are key to explaining the disadvantage of African countries in firm performance relative to countries at similar levels of income in which firms perform better. The results of the new Oxford survey, which covers both formal and informal firms, shed light on manufacturing firm performance in Africa in relation to that in Asian countries such as China. The survey results suggest that, whatever the reasons for China's success relative to Africa, it is unlikely to be less regulation. Indeed, China seems to have more stringent registration requirements and labor laws. It is also unlikely to be corruption, lower labor or land costs, or social networks: Chinese firms report fewer links with banks and politicians and fewer business friends. There also are no strong differences across the countries in the rate at which individual firms innovate and invest. The dimensions along which Chinese firms are at an advantage appear to be finance, competition, information about innovations, and educational attainment. Asian workers and entrepreneurs have more schooling. Nonetheless, education is not a good predictor of how quickly production workers can become fully active in firm operations.